In my early 20s windsurfing was something I wanted to try but I had assumed was not possible. I had problems standing on solid ground and so how on earth could I balance on a board? But I love getting wet and so I tried it anyway, having one to one lessons. Then as I was trying to figure out where I should really put my feet ‘in my language’ rather where the instructor wanted me to put them, it stuck me, why not try it sitting down. My thinking was by lowering my centre of gravity I was more likely to stay on the board. 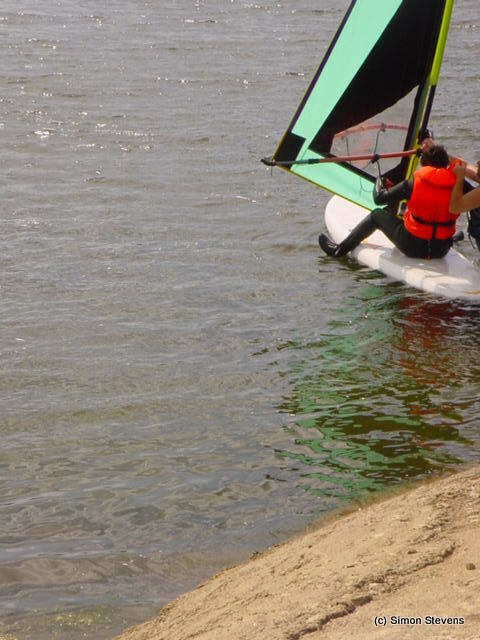 So after some trial and error, I was able to successfully windsurf on my bum using an adult board and child’s sail. As a dangle my legs over the side, my wetsuit and booties are invaluable to stay warm! With another tick in my life, it demonstrates problem solving is about identity looking at the problem from all angles and focusing on the outcome and not have a fix method in mind. If we want something and willing to try, anything is possible. I came to windsurfing understanding my limitations but with a willingness to try that lead to my creative success! ← Why must disabled people think small?